Pro Spec Home Inspection can also perform a radon test on your existing home or a new home you are looking to purchase. Radon is the leading cause of lung cancer for non-smokers and the second leading cause of lung cancer for the general population. The Surgeon General and EPA recommend testing for radon and reducing radon in homes that have high levels. Fix your home if your radon level is confirmed to be 4 picocuries per liter, pCi/L, or higher. Radon levels less than 4 pCi/L still pose a risk, and in many cases may be reduced. Radon is a radioactive gas that comes from the natural radioactive decay of radium, which is a natural decay product of uranium. Scientifically, “radon” is known to be radon-222, the most abundant isotope of the element radon. As a noble gas, radon is colorless, odorless and chemically inert and cannot be detected by human senses. Also, since radon is not chemically reactive with most materials, it will move freely as a gas. Radon has a radiological half-life of 3.8 days, and can move substantial distances from its point of origin. Soil and water are the two main sources for the radon in homes and buildings. Air pressure inside your home is usually lower than the pressure in the soil around your home’s foundation. Due to this difference in pressure, your house draws radon in through foundation cracks and other openings. Your home then traps the radon inside, where it can build up. Some homeowners have the misconception that radon only affects older homes and new houses don’t have this problem, however, radon can infiltrate all types of houses. Newer houses have the benefit of using radon-resistant construction techniques during building, which can be effective in preventing radon from entering the house. No matter the age of the house, every house should be tested for radon after occupancy. Radon may also be present in well water, and can be released into the air in your home when water is used for showering and other household uses. In most cases, radon entering the home through water is a small risk compared with radon entering your home from the soil. In some homes, the building materials (e.g., granite and certain concrete products) can give off radon. 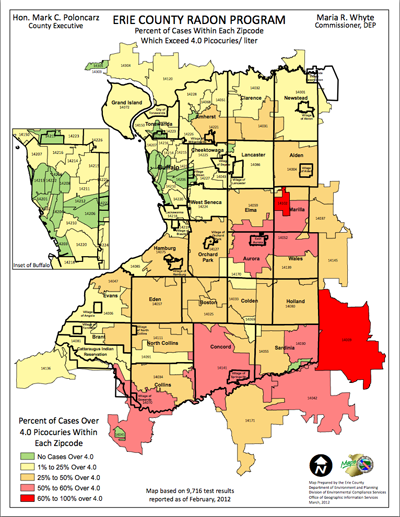 For more information from the EPA regarding Radon click here. 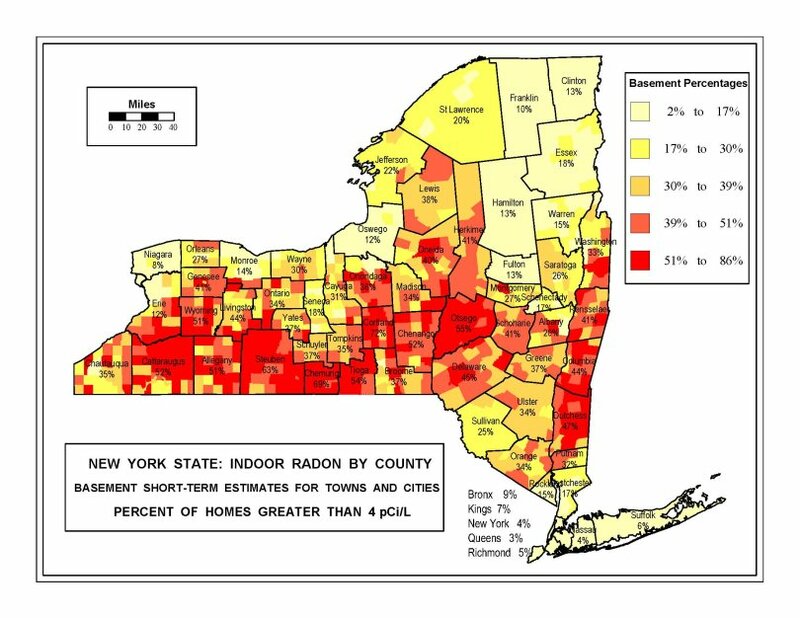 To give you some idea of the locations of elevated levels of radon, we have included a map from the New York State DOH website.